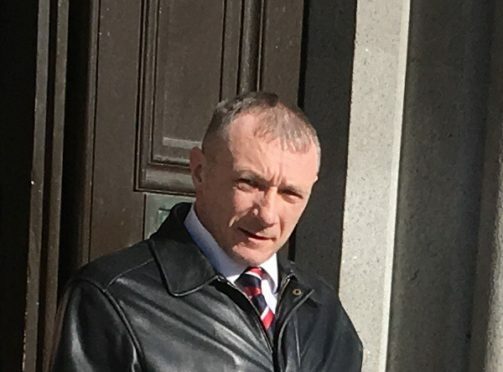 An Aberdeen man has admitted threatening to cut his fiancee’s finger off if she did not hand over her engagement ring. Edmond Omond grabbed a kitchen knife when Theresa Duncanson refused to surrender the jewellery after a house party descended into chaos. Aberdeen Sheriff Court heard she then took fright and swiftly stripped the ring from her finger, before calling police. Omond, 42, had spent hours drinking with Miss Duncanson and others at her house before issuing the threats. He was fined £400 yesterday for what a sheriff said was “a serious offence” but the court heard the couple remained together. And they hope to wed later this year. The court heard that Omond, of Ramsay Crescent in Aberdeen, initially became annoyed at the other guests, who had left his partner’s house “in disarray”. He is said to have believed they were “disrespecting” Miss Duncanson, but after several hours had passed, the atmosphere in the house worsened to the point where the couple themselves began to argue with one another. Omond decided he wanted to break off their relationship and insisted she give back her engagement ring. The court was told he then took a knife from the kitchen and threatened to cut her finger off and take it back himself. Miss Duncanson was so scared that she removed the ring and handed it over. The police were subsequently called. Omond pleaded guilty to brandishing a knife at his fiancee, threatening to cut her finger off and demanding and subsequently robbing her of the ring, while on bail in connection with a separate allegation. Defence agent Gayle Goodfellow said the pair had been in a relationship for three years at the time of the incident. Despite the nature of his offence, she told the court that Miss Duncanson had told police she wanted to stay with him at the time of the incident. She added that they were still together planned to marry later this year. Ms Goodfellow said Omond could not remember much about the incident and that although it was technically robbery, he had really asked for the ring back – a ring he had purchased. Sheriff Ian Wallace said he had taken into account Omond’s efforts to address his drinking problem but said it was clearly a “serious offence”.